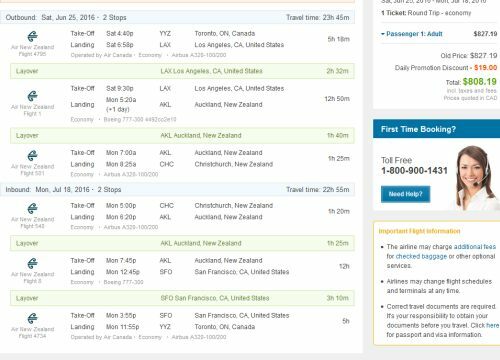 A number of booking sites are showing flights from Toronto to Auckland with Air New Zealand for as low as $729 CAD roundtrip including taxes. It's likely a mistake fare, so keep the expectations low if you book it, and wait at least 48 hours for the dust to settle, and it becomes clear that your booking is confirmed by the airline. booking site is showing the cheap price. So far I've seen them on Travelocity, Expedia, CheapoAir, and FlightHub. If you're up for taking a really long trip to New Zealand, there also seems to be flights from June to, say, November 2016 available for $695 CAD roundtrip including taxes. 2. On the Kayak search result, click on the orange 'Select' button and select Expedia as the booking site. It won't work if you click through to the Air New Zealand site. It doesn't have to be November that you return though. When testing it out, you can try changing the return date on Kayak to a date in August, September, October, November, or December 2016, or January, February, March, or April 2017, and you still have a good chance of finding flights for $695 to $729 CAD roundtrip including taxes. Keep the dates flexible on Kayak when searching. And remember to click through to Expedia, not Air New Zealand, to find this price. 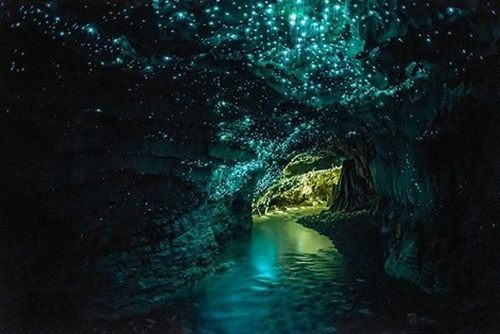 Other cities in New Zealand: Toronto to Christchurch (CHC), Wellington (WLG) , or Queenstown (ZQN) are available for $808 CAD roundtrip including taxes. Try substituting these cities on the Kayak searches above. Click through from Kayak to Expedia or FlightHub or CheapoAir. Virtually all destinations in New Zealand seem to be available for this price. Even Nelson (NSN). toronto, yyz, flight deals, air new zealand, australasia, oceania, auckland, new zealand and akl.